Donald Trump and Bernie Sanders are both presidential hopefuls in the 2016 presidential elections. The two are currently seeking party nominations on their respective political parties. Bernie Sanders is running for president on a Democratic Party ticket while Trump is seeking the same position through the Republican Party. Sanders formally announced his entry into the presidential race 0n 30 April, 2015 while Trump declared his candidature on 16 June, 2015. The purpose of this article is to identify the difference between these two individuals. Bernie was born Bernard Sanders on 8, September 1941 in Brooklyn, New York to Jewish parents; Eli Sanders and Dorothy Glassberg. Upon graduating from the University of Chicago with a Bachelor of Arts degree in political science, Sanders relocated to Vermont in 1964. It is while in Vermont that Bernie kicked off his political career in 1971 when he joined the Liberty Union Party. After making several unsuccessful attempts to run for political office on the said party, Sanders resigned from the party in 1979. His political breakthrough took place in 1981 when he vied to be mayor of Burlington and won. He retained his position as Burlington’s mayor for four terms and decided not to seek reelection for another term. He however was back in the political stage in 1990 when he was elected to the US House of Representatives as an independent candidate. He retained his seat for 16 years and left it in 2006 having been elected to the US senate as Vermont’s senator of which he is the incumbent. Sanders has married twice and his current spouse is Jane O’Meara Driscoll. He has one child and three step children. Donald John Trump was born to Mary Anne and Fred Trump on 14 June, 1946 in Queens, New York. He is a business man widely known across the U.S. for his NBC reality show- The Apprentice and the success of his many other business ventures. In 1968, Trump graduated with a Bachelor of Science degree in economics from the University of Pennsylvania – Wharton School of finance. Trump, who is a father of five has married thrice and he is presently married to Melania Knauss. He describes himself as a Christian and a member of Presbyterian Church. Unlike Bernie Sanders, Trump has not held any political office in the past though he sought the presidential nomination of the Reform Party in 2001 and later pulled out of the race. Sanders has a net worth of $500,000 which is way lower than that of Trump whose net worth is valued at $ 4.5 billion. 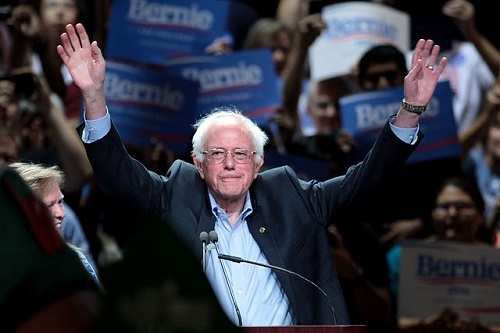 When compared to Trump’s campaign, Sanders has the longer running campaign by three weeks. Of the two presidential candidates, Sanders is far more liberal on individual rights. For instance, with regard to abortion rights, Sanders has expressed his support while Trump has taken a more conservative stance claiming he is pro-life. Trump has received significantly more media attention in comparison to Sanders. While Sanders has not been entirely ignored by the press, his campaign has received less media coverage compared to Trump’s campaign. Moreover, whilst Sanders is campaigning largely on substantive policy positions, Trump has based his campaign mostly on the force of his personality since he is an established brand across the U.S. In addition, Sanders is in support of the recent Iran nuclear deal and he has argued that supporting it is giving peace a chance since the alternative to reaching an agreement is war. In contrast, Trump is in opposition to the deal and claims it is a terrible deal. Fancy Kirui. "The Difference Between Bernie Sanders And Donald Trump." DifferenceBetween.net. September 28, 2017 < http://www.differencebetween.net/business/the-difference-between-bernie-sanders-and-donald-trump/ >.